"I wanted it to be comfortable and feel like you were walking into your house," says owner Chris Banka. The shockingly cold towel wrapped around my face is a wake-up call from an utterly luxurious experience — a straight-razor shave at Brickyard Barbershop. The brisk return to reality came after some serious quality time in the chair, as various lotions and potions were massaged into my beard, along with multiple rounds of hot towels that nearly put me into a trance despite the British metal playing over the shop's sound system. It seemed like almost a half-hour of work went into preparation before barber Matt Case put a blade to my skin. This was my first experience with a straight-razor shave, or at Brickyard Barbershop, and it was the type of memorable grooming adventure that owner Chris Banka was hoping to provide when he opened up in the spring of 2016. Our readers clearly think that he and his fellow barbers have done the job so far, voting Brickyard Barbershop the best in the Inland Northwest. "I wanted it to be a traditional-style barbershop, but I also wanted it to have a friendly environment," Banka says about the space he put together inside a 111-year-old building on North Monroe. "I wanted it to be comfortable and feel like you were walking into your house, but also unique at the same time. I wanted people to walk in and say, 'Wow, I've never been to a barbershop like this.'" It's safe to say most haven't been in a barbershop where mounted buffalo and elk heads share wall space with African masks hanging above the six chairs. A bright "Spokane" sign is a bold touch in the building that Banka had to basically strip down and completely redo before opening the shop. If Banka and his fellow barbers didn't have serious chops, though, all the hip accoutrements of the shop wouldn't amount to much. It's a busy shop, and walk-in cuts are more a rarity than the rule, thanks to many of the barbers booking appointments a good month in advance. And while many customers followed Banka and his crew from other places to Brickyard when it opened, he sees a lot of new, young customers catching on to the fact that a quality haircut is a worthy investment. 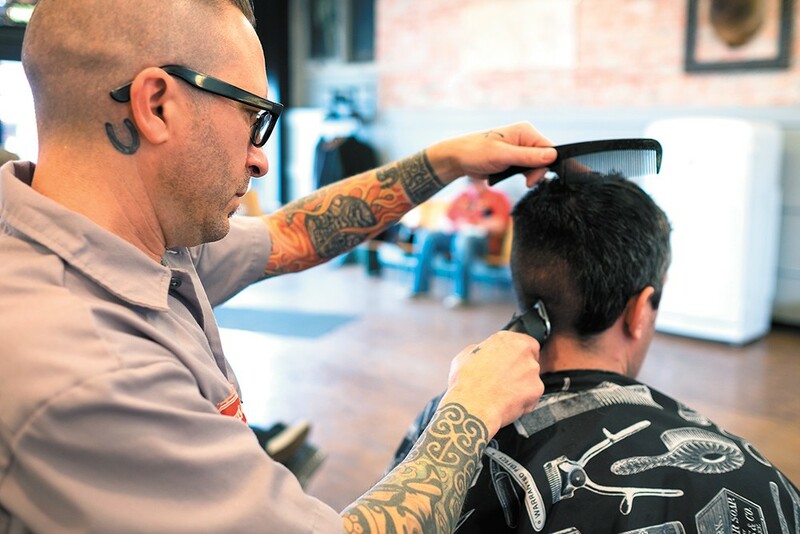 "The whole barbering trend has really begun to take off," Banka says. "More and more younger guys, they care about how their hair looks now. For so long, younger guys, high school and college age, they just wanted shaggy hair. They didn't want to spend money on it. We thought, let's give them a place where they realize it's not a chore to go get a haircut. They actually enjoy it and look forward to it."